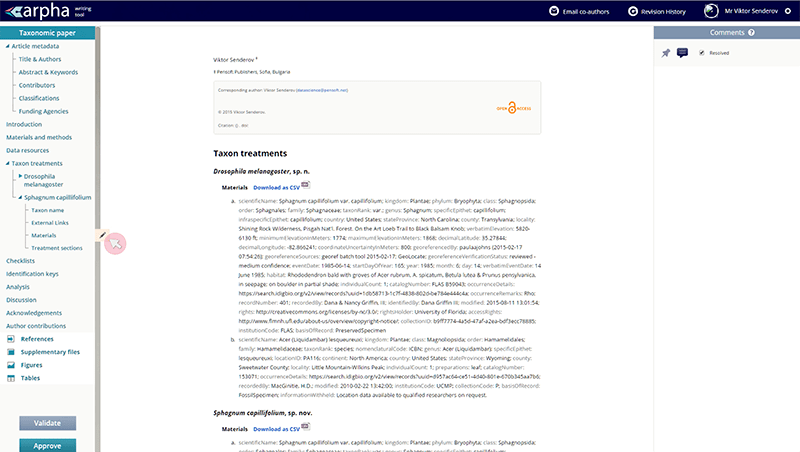 On October 20, 2015, we published a blog post about the novel functionalities in ARPHA that allows streamlined import of specimen or occurrence records into taxonomic manuscripts. Based on our earlier post, we will now go through our latest updates and highlight the new features that have been added since then. 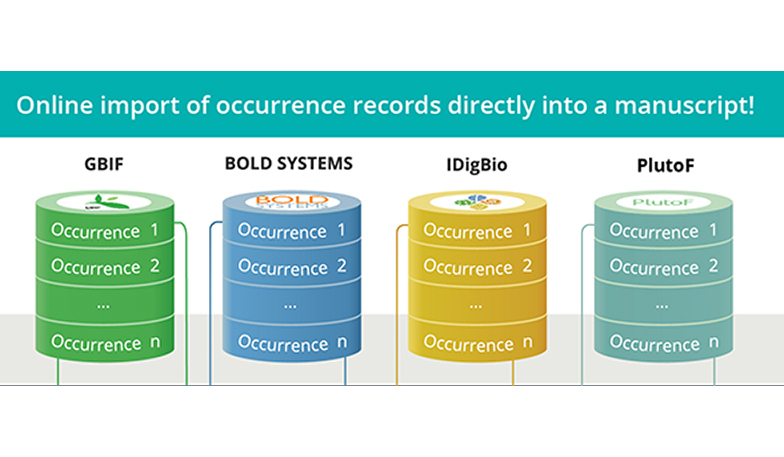 Repositories and data indexing platforms, such as GBIF, BOLD systems, iDigBio, or PlutoF, hold, among other types of data, specimen or occurrence records. It is now possible to directly import specimen or occurrence records into ARPHA taxonomic manuscripts from these platforms [see Fig. 1]. We’ll refer to specimen or occurrence records as simply occurrence records for the rest of this post. [Fig. 1] Workflow for directly importing occurrence records into a taxonomic manuscript. Until now, when users of the ARPHA writing tool wanted to include occurrence records as materials in a manuscript, they would have had to format the occurrences as an Excel sheet that is uploaded to the Biodiversity Data Journal, or enter the data manually. While the “upload from Excel” approach significantly simplifies the process of importing materials, it still requires a transposition step – the data which is stored in a database needs to be reformatted to the specific Excel format. 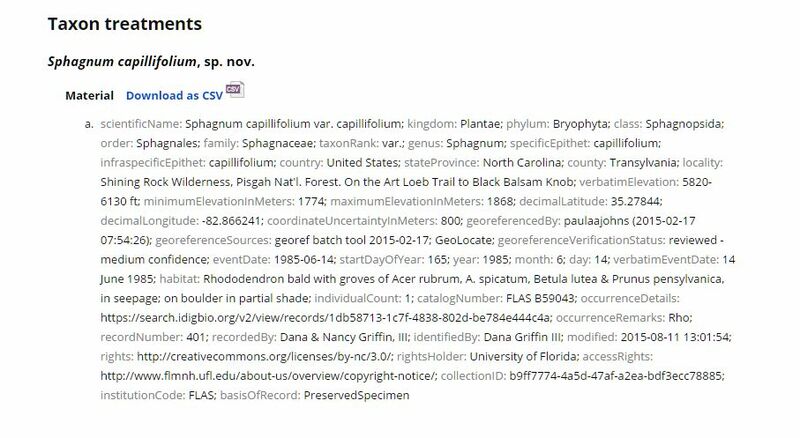 With the introduction of the new import feature, occurrence data that is stored at GBIF, BOLD systems, iDigBio, or PlutoF, can be directly inserted into the manuscript by simply entering a relevant record identifier. Select a particular database from a list, and then simply clicks ‘Add’ to import the occurrence directly into the manuscript. In the case of BOLD Systems, the author may also select a given Barcode Identification Number (BIN; for a treatment of BIN’s read below), which then pulls all occurrences in the corresponding BIN. We will illustrate this workflow by creating a fictitious treatment of the red moss, Sphagnum capillifolium, in a test manuscript. We have started a taxonomic manuscript in ARPHA and know that the occurrence records belonging to S. capillifolium can be found on iDigBio. What we need to do is to locate the ID of the occurrence record in the iDigBio webpage. In the case of iDigBio, the ARPHA system supports import via a Universally Unique Identifier (UUID). We have already created a treatment for S. capillifolium and clicked on the pencil to edit materials [Fig. 2]. In this example, type or paste the UUID (b9ff7774-4a5d-47af-a2ea-bdf3ecc78885), select the iDigBio source and click ‘Add’. This will pull the occurrence record for S. capillifolium from iDigBio and insert it as a material in the current paper [Fig. 3]. This workflow can be used for a number of purposes. An interesting future application is the rapid re-description of species, but even more exciting is the description of new species from BIN’s. BIN’s (Barcode Identification Numbers) delimit Operational Taxonomic Units (OTU’s), created algorithmically at BOLD Systems. If a taxonomist decides that an OTU is indeed a new species, then he/she can import all the type information associated with that OTU for the purposes of describing it as a new species. Another important aspect of the workflow is that it will serve as a platform for peer-review, publication and curation of raw data, that is of unpublished individual data records coming from collections or observations stored at GBIF, BOLD, iDigBio and PlutoF. Taxonomists are used to publish only records of specimens they or their co-authors have personally studied. In a sense, the workflow will serve as a “cleaning filter” for portions of data that are passed through the publishing process. Thereafter, the published records can be used to curate raw data at collections, e.g. put correct identifications, assign newly described species names to specimens belonging to the respective BIN and so on. The work has been partially supported by the EC-FP7 EU BON project (ENV 308454, Building the European Biodiversity Observation Network) and the ITN Horizon 2020 project BIG4 (Biosystematics, informatics and genomics of the big 4 insect groups: training tomorrow’s researchers and entrepreneurs), under Marie Sklodovska-Curie grant agreement No. 642241.